The £13.00 discount is in promotions, simply press redeem and it will take £13.00 off at checkout. With the fantastic warranty on this, its a No Brainer. Rav Power have great customer service. 18 month warranty + a further 12 months after registration. I don't think u get it, that is the price , £42.99. £13 come off at check out. I'll try send pic. U need to select promotions just below the image to get discount. Would this jump start a land rover discovery 3 which has a 3 litre engine? I don't think u get it, that is the price , £42.99. £13 come off at check o …I don't think u get it, that is the price , £42.99. £13 come off at check out. I'll try send pic. U need to select promotions just below the image to get discount. Possibly if petrol, that's what their tech details claim, but not diesel , you would need a more heavy duty for that. I got sent a similar one of these out last year to review. Absolutely awesome piece of kit to keep in your boot, glovebox or under the seat. Does not ship to Northern Ireland!! I hate Amazon when it comes to batteries!! Any idea how long it holds it's charge for? Couldn't see that info anywhere. I have a similar one that said not suitable for diesel, started my 2.5 diesel no problem. Make sure to check the charge often as it does drain itself. Just ordered one and discount applied via the link! Looks a great bit of kit. Hope it works as well as all the reviews show! I can now get rid of the old booster/ jump start thing bought from MAKRO many years ago. Fakespot looks more fake than the reviews, I think most regular Amazon shoppers can tell fake reviews. Besides fake reviews would not benefit this company it would cause it loss, as they offer an incredible guarantee and their customer service is top notch in my experience. Fakespot looks more fake than the reviews, I think most regular Amazon …Fakespot looks more fake than the reviews, I think most regular Amazon shoppers can tell fake reviews. Besides fake reviews would not benefit this company it would cause it loss, as they offer an incredible guarantee and their customer service is top notch in my experience. Forfget the site, just read the crap in the reviews! 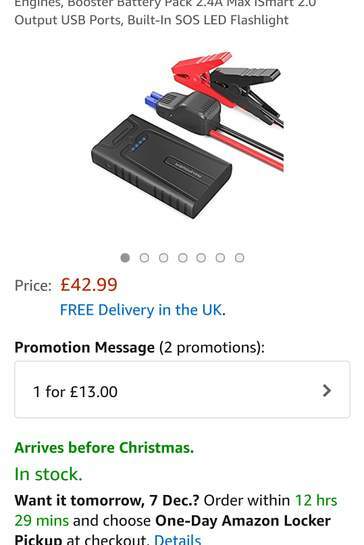 I know what you mean, there are a couple of review which seem very promotional, who may have got the item free to review, however don't forget you have 2 month to test and try it for yourself, Amazon returns are till end of January. Will this work with a mk3 galaxy 2.0 diesel engine? Might take a punt on this as I need something to jump my 306 Rallye that has been neglected and stood for 5 months now. Tried to get my scraper from it the other day and the battery is that flat, the remote central locking won't even work! Most of the reviews are obviously fake (you just have to look at the peoples review history)I'm sure it'll be fine though. How do you use this? 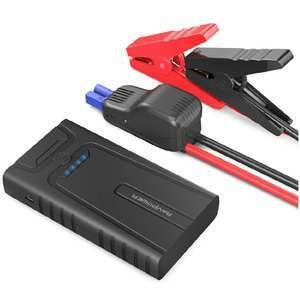 connect this to the car battery and try to start your engine?